Create a memorable experience by branding from the inside out. Your branding should be exhibited throughout your space in everything the customer sees. We help you create a visual identity using signage, menu boards, murals, and more. The result is a distinct atmosphere that will resonate with customers and keep them coming back. 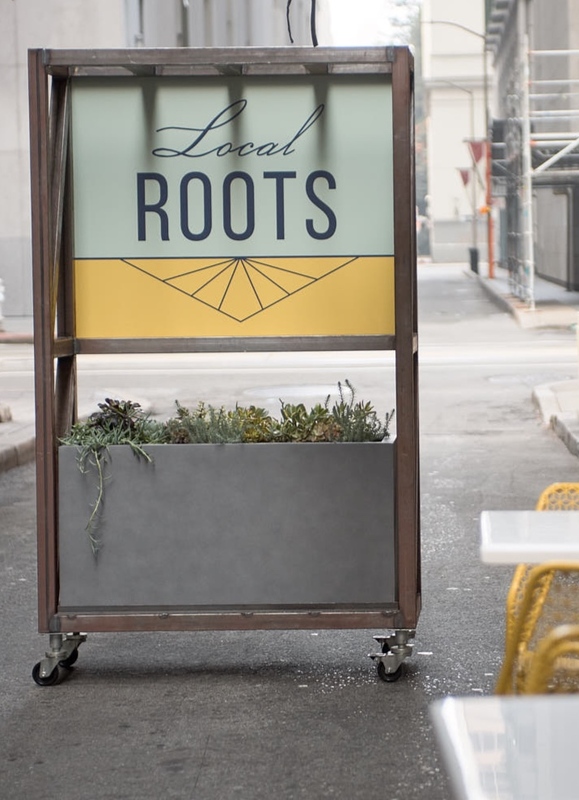 The signs on your exterior help customers find you and get a sense of what your restaurant is all about. We help ensure your storefront makes a great first impression. The signage solutions are tailored to your location with the goal of expressing your brand and attracting customers. Your restaurant’s menu is a great opportunity to make an impact on guests. We work with you to design menus and menu boards that showcase your food and reflect your brand. Whether your restaurant is fast casual or full-service, we have you covered. Creating design solutions for chains and franchises can be a challenge. We have developed a strategy that works. The process starts with a strong brand identity and design concept. The concept is implemented at one location, a prototype. Clients can test out the concept with customers. When ready, the prototype is adapted for other locations. Our design of Cafe Venue at Montgomery St launched a brand refresh for the San Francisco chain. Propelled by a lease renewal and growing competition nearby, the owner hired us to update the 2,400 sq. ft. interior of the fast-casual lunch spot, which opened 1997. Inspired by the interior design concept, the client decided to give the branding a face-lift including a new look for the logo, menu boards an exterior signage. The result is quite the transformation, a design solution that served as a prototype for the other 2 Cafe Venue locations. The new Cafe Venue brand identity had to feel modern while not alienating their loyal customer base. Early conversations quickly determined that the name was what people recognized, giving us flexibility with the logo. Our graphic designer's brand identity included an elegant logo and slogans that Negi’s team felt perfectly represented the next chapter for their brand. The design team was so inspired that the new brand identity was used throughout the space, lining walls inside and out of the restaurant. 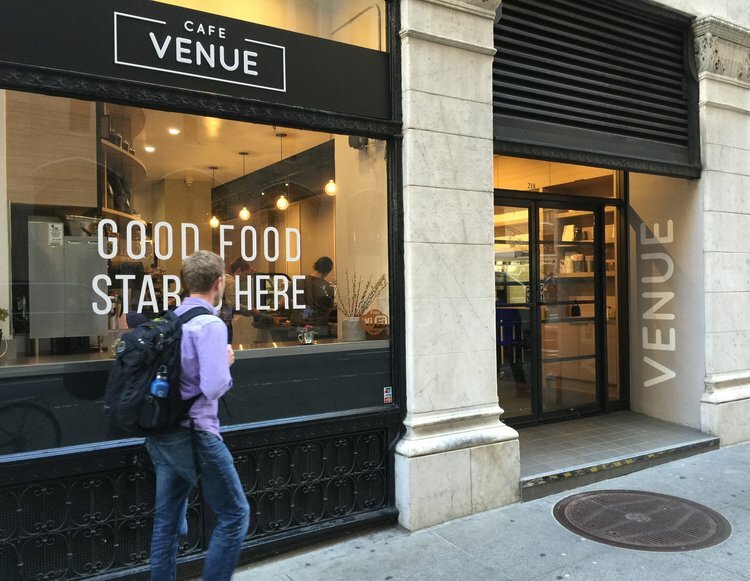 When Cafe Venue reopened, customers said they loved the update. EXTERIOR SIGNAGE The architecture of the front facade at Cafe Venue was already beautiful but the only signage was an illuminated sign in the window that was easy for passersby to overlook. KDD came up with a 3 tiered solution that would increase visibility and make use of the storefront architecture. The result was a storefront that makes the restaurant stand out and makes a great first impression of the brand. MENU DESIGN The current menu boards did not match the new, modern design of Cafe Venue. KDD designed new menu boards that complimented the restaurant's new look. Visually, the black menu boards pop, particularly against the white wall in the restaurant. We also re-formatted the text on the boards and changed the layout to make them more legible. THE RESULTS Our design of Cafe Venue Montgomery launched a brand refresh for the SF chain and includes: update of interior and exterior, new logo, website, signage, menu boards, and more. And we are thrilled that new and regular customers are enjoying the new space. Think we’re a good fit? Let’s get started.